Wow, it’s actually turned out to be a lovely lovely Sunday. We’ve just been for a lovely Sunday dinner, and now I am STUFFED, but it was so worth it! 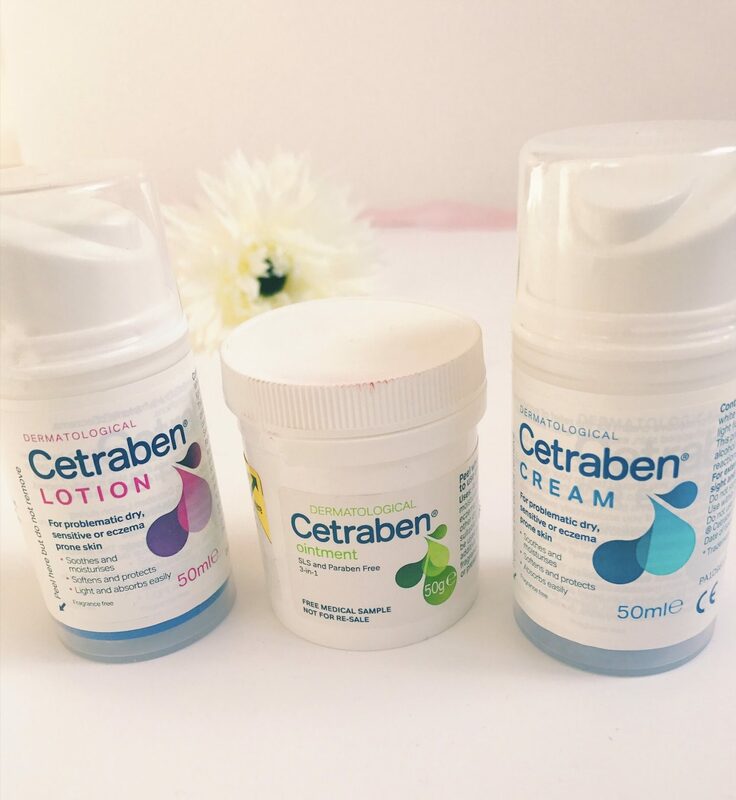 So today on the blog I am reviewing the Cetraben cream range as I suffer from dry, irritable eczema skin. I was kindly sent three of their products to try and test out and I’d love to share with you my thoughts if you suffer from dry skin too! The cream claims it softens and protects, locks in moisture, and also absorbs easily. I’d pretty much say they are not wrong stating any of these points. I felt the cream was really smooth and felt very moisturising, but also didn’t linger on the surface of the skin too long as well. The cream is fragrance free doesn’t have a nice smell as such, but doesn’t really have a horribles smell either. It just smells quite clinical, which is similar to a lot of prescription creams I’ve tried before, which I don’t mind. Overall I rate this cream and I have been using it frequently as a way to seal in the moisture after a bath/shower as that’s what my skin is not good at doing! Damn skin! This is very similar to the cream, other than the fact it is slightly lighter, it does pretty much the same thing. I have been using this on my body and the cream on my face, only because I like to really moisturise my face so like thicker creams. I like this product as well as I feel it does really moisturise my skin and leaves me feeling less itchy and dry. Now, I’m going to be honest, I don’t really get on with ointments that well, and I had the same response with this one. I just find ointments difficult to work with, they are extra think and sticky and really take a while to absorb so it’s hard not to doing anything for a while. They may be good for some people as they are super moisturising, and if you are going to apply this, it’s best to do it over night, which I sometimes do – this way you have a long time for the product to absorb into the skin. So overall I am impressed with these products, and as I mentioned I prefer the consistency of the lotion and the cream and I will be carry on using these. I will, however say that as a suffer of Eczema for my whole life, I have tried a LOT of creams and there are some that are better than others, but these are as good as the prescription one I get, so I’m happy these were sent to me! Thank you Cetraben! Have you tried their products? Does anyone have any key products they can recommend of dry skin? So many people have recommended Cetraben and I’ve heard such great things about them too. I will have to look into the lotion for the dry patches on my cheeks. Great review! I personally don’t have dry skin but these products sound great for those who do! Also love that they don’t test on animals! I’ve never used any of these products but I’m thinkingI should look into them! This is so great, thanks for sharing! Honestly my biggest struggle is dry skin, especially in my hands during winter time where I live. I have been using a hand cream called Ceracil which seems to help, but this also seems like a great product to try! When I worked in a pharmacy this was being prescribed by doctors all the time so it must be good!